They say gardening is the best form of therapy. It also might be the cheapest. I have the utmost respect for those who grow fruits and veggies in their very own gardens. I can’t even fathom the time commitment it must take to plant, water, and harvest everything. I barely find the time to walk through the produce department at my local grocery store, so kudos to those of you with green thumbs. With that being said, I’ve tried my hand at gardening on quite a few occasions, each time with disastrous results. Long story short, everything green I touch turns to dust. I am really good at making fertilizer out of all the plants I’ve managed to kill, though. So for those of you out there in the same boat as me, here are 20 tips that will make everyone think you belong on the cover of Fine Gardening. 1. Turn your used plastic cutlery into garden markers. 2. No watering can? No problem! Make one with an empty milk container. 3. Store your extra seed packets in an empty photo album. 4. Save your fast food cup carriers for an awesome place to start growing your seedlings. 5. Decrease the number of tools you need in your garden by turning your rake into a measuring stick. 6. Create your own garden markers out of rocks. 7. Combine four liters of vinegar, 250 grams of table salt, and one tablespoon of hand soap to make your own weed killer. 8. 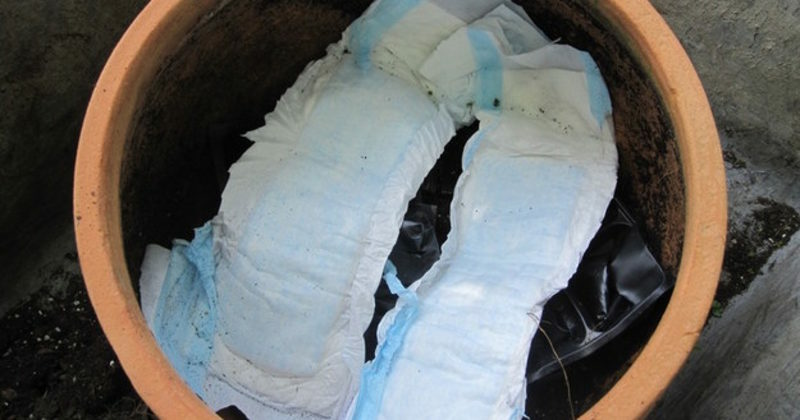 Adding diapers to your pots will hold in moisture, keeping your soil moist for days. 9. Toilet paper also serves as an excellent seed tape. 10. Start out your seedlings in used egg shells for a perfect biodegradable pot. 11. Water your houseplants with just a glass of water and a paper towel. 12. Keep soil from leaking out the bottoms of your pots with a coffee filter. 13. Create this awesome hanging garden with a shoe organizer. 14. Have an old shower caddy hanging around? Transform it into a vertical garden. 15. Who knew you could grow seeds in a lemon? 16. Soak your seeds in water 24 hours before you’re ready to plant them. 17. Paint your worn-out tires and turn them into unique planters. 18. Banana peels are the perfect fertilizer to help your rosebushes grow. 19. Save the ashes from your summer campfires — they make an excellent fertilizer. 20. Never forget to water your plants again with this automatic waterer. These tips make gardening look so easy. I’ll have a green thumb in no time!